Perfect: that's some claim. Yet Philips is so conﬁdent about what its latest image processing system can do that it's called Perfect Pixel HD. And the superlatives don't shop there: Perfect Pixel HD contains elements dubbed Perfect Colour, Perfect Contrast, and Perfect Natural Motion. How modest. 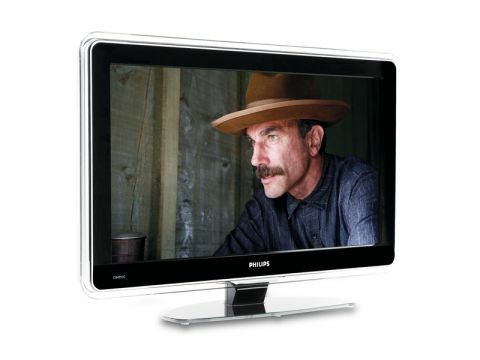 But, does all this talk of perfection inevitably set the Perfect Pixel HD-sporting Philips 32PFL9603D up for a fall? All this so-called Perfect technology is at least housed in a suitably attractive home. This 32-incher's combination of a gloss black bezel, silver trim, rounded corners, distinctive translucent 'shroud' curving forward around the TV's edges from its rear and the latest Philips Ambilight Spectra technology is simply a joy to behold. The design isn't just pretty, either – it's also functional. The translucent shroud helps the sound from the built-in speakers on the TV's sides focus forward at the viewer, while the 'stereo', LED-based Ambilight system is proven to make long-term viewing more relaxing. Plus, it's a perfect after-dinner conversation starter! Connectivity is as easy on the eye as the TV's bodywork, thanks to the inclusion of four v1.3 HDMI inputs, a USB port able to play MP3s, .alb slideshows, JPEGs, and MPEG1/2 videos, and even a DLNA Ethernet port for adding the TV to your home PC network. We're sure such multimedia talents will one day be commonplace, but right now they're still rarer than a Premier League manager who's safe in his job. Maybe the TV will start to slide a little with its screen speciﬁcations? Quite the opposite – the boasted 55,000:1 contrast ratio and full HD pixel count are both outstanding discoveries on a 32in LCD TV. Throwing our Blu-ray test movie of There Will Be Blood at this 32-incher, we settled down to some simply sensational hi-def action. Pictures look astonishingly detailed, textured and sharp during the movie's outdoor desert sequences. Pictures are so good that this TV single-handedly destroys the argument that HD makes little difference on a screen as small as 32in. What's more, the latest Perfect Pixel HD system has the wherewithal to make standard deﬁ nition images look amazingly detailed too – almost 'pseudo HD', in fact. It also achieves this without generating anywhere near as much 'shiny' edge noise and grain as previous Philips processing engines have. Superb stuff. The 32PFL9603D's sharpness is further enhanced by some excellent motion handling, which leaves the frenetic action as Daniel Plainview's men scramble to 'tame' an exploding oil derrick in looking free from judder and blur. The sort of motion clarity we're talking about becomes particularly remarkable if you call in the HD Natural Motion component of the Perfect Pixel HD engine. This interpolates new, extra frames of image data based on assessment of how best to join together the 'real' image frames in the source signal – and its effect on the ﬂuidity and clarity of ﬁlm sources is mesmerising. So much so that when you watch an 'ordinary' TV, you are acutely aware of the judder and blurring that more than likely characterises its motion handling. We've not actually been big fans of Philips' Natural Motion tech in the past, ﬁnding its effects unnatural and its side effects hard to tolerate. But here, the huge amounts of extra power Philips has provided for its image processors, together with new improvements to its processing algorithms, have ﬁnally succeeded in making the feature something to behold. Colours are blisteringly intense, even by LCD standards. But crucially they're also extremely natural, leaving us drooling at the prospect of Philips' upcoming 9703 models, with their wide colour gamut panels. Colours as good as those of the Philips 32PFL9603 wouldn't happen without good black levels. In fact, once again the 32PFL9603D is in class-leading form in this critical department, achieving blacks that suffer only minor grey clouding, and plenty of shadow detail in dark areas, as is evident in the movie's opening mining scenes. The only negative thing we have to say about the Philips 32PFL9603D is that the TV demands attention to get the best out of it. Some of the processing settings that work really well with for movies, for instance, can cause artifacting issues with sport. And setting some of the picture processing elements any higher than their 'low' settings – especially HD Natural Motion – can sometimes cause pictures to start looking a little bit processed. But if you commit to revisiting the TV's settings on a regular, source-dependent basis, the rewards will be absolutely huge.